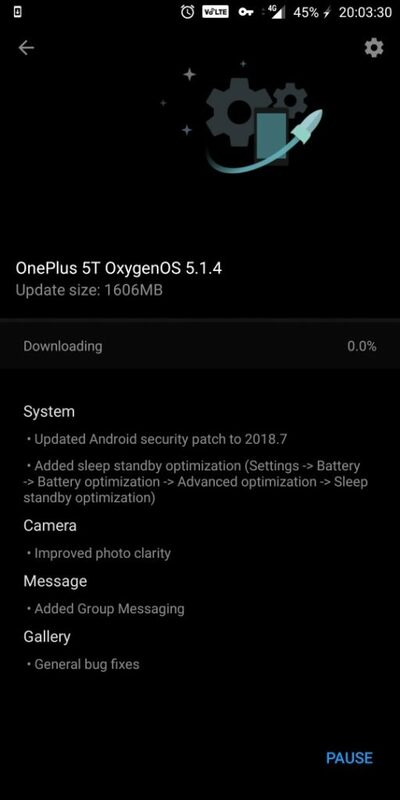 Update: OnePlus 5 and 5T Oxygen OS 5.1.5 is now available with August 2018 Android Security Patch. The update also features Treble Support. Although the manufacturer did not advertise it, OnePlus 5 users have reported that it brings full treble support. this means, you can readily flash the Android 9 Pie GSI or any Generic System Image and update OnePlus 5 or 5T to latest Android version. So download and install Oxygen OS 5.1.5 for OnePlus 5 and 5T based on Android 8.1 Oreo. OnePlus released official Android 8.1 Oreo update for the OnePlus 5 and 5T with a new firmware build OxygenOS 5.1.4. Moreover, the Open Beta channel for the two devices already features Project Treble support. This is now for the stable Oxygen OS channel. Only a handful of devices support Project Treble officially such as the Samsung Galaxy S9, Essential Phones, Razer Phone, Sony Xperia, Huawei, etc. In order to get the OTA update, is simply go to settings, system updates, and check for OTA updates. If you get the latest Android 8.1 Oreo update notification, download and install it. The OTA zip weighs about 766 MB in size. But this only applies for the devices running on stable Oxygen OS 5. For devices on Open Beta, we have listed the signed full firmware zips for the two devices below. So it is easy for you to manually upgrade your phones. Apart from the latest Oreo firmware, the update also comes with August 2018 Android Security Patch. It features Project Treble Support. 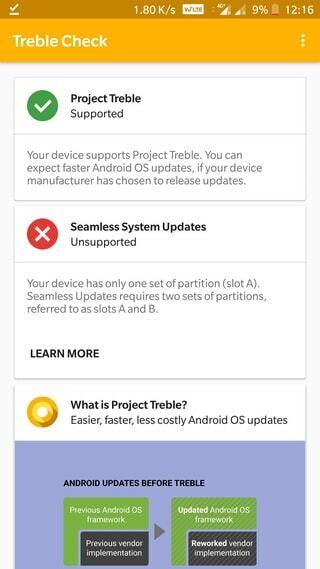 How to check if your Android device supports Project Treble? Download the Treble Checker app and launch it. You will also see a new Gaming Mode support and optimizations. The OnePlus Launcher has two new features that adds category tags in the search section of the app drawer and auto naming of folders based on categories. Moreover, the devices will also receive the latest Android P 9.0 update in the upcoming months. So stay tuned for the Open Beta updates. Currently, both the OnePlus 5 and OnePlus 5T have received the full stock firmware update zip. How to update OnePlus 5 and OnePlus 5T to Oxygen OS 5.1.5? There are multiple ways to update OnePlus devices to the latest firmware update. Method 1: How to capture OTA update zip? Download OTA and install using stock recovery or ADB sideload method. If your device is on Open Beta update, then see the second Local upgrade method below. Make sure your OnePlus 5/5T is on the latest previous OxygenOS update. Download and install a VPN app like Opera VPN. Launch the VPN app and change the device location to Canada or Germany. Now go to Settings > System updates > check for OTA update. Method 2: How to update OnePlus using Local upgrade method via full stock firmware zip? First, download the full stock firmware zip from above for the OxygenOS 5.1. Transfer the files to the root of phone storage. Meaning, outside every folder. Now go to Settings> System update> Tap on the top right settings icon > Choose local Upgrade. 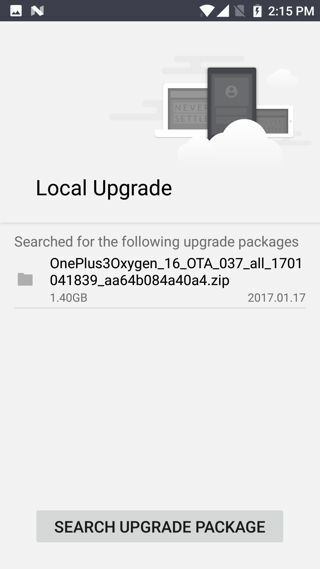 The Local Upgrade option will search for an OxygenOS package. This method requires the latest TWRP recovery. Make sure you have the modded recovery listed above setup on your device. Download and transfer the OxygenOS 5.1 firmware from above to device storage. Tap on in install and flash the OOS zip. Also modifies the notification pull-down to make room for a non-existent notch. Apparently they really designed this update for the new OP6. I’m downgrading, for now, maybe they’ll not gimp the notification pull-down on the Android 9 update for the 5/5t. But I suspect their efforts will be focused elsewhere from this point on. Everything else about this update seems fine.